In these days all the pressure is on speeding up children's education, and making the little hoydens more receptive: the object of the exercise being, naturally, to make then better wage earners with higher skills, and thereby push then into a higher tax bracket. The most recently recommended technique is to teach then (larn 'em?) a second language. Apparently someone who sits behind a desk and studies statistics has discovered that children who are introduced to a language1 other than the native one learnt from mum, find the process so fascinating that it stimulates both keenness and ability to learn - no matter what the subject. Obviously, if this is done during the lunch break, as is suggested1 it will suppress the innate brutality of children, and the equally innate reluctance of teachers to be at the receiving end of a punch up in the playground. Alas, (and the use of that word dates me) I have fluffed my chances. There I was in the heart of nautical Suffolk, where every other man had one webbed foot from messing about in drifters, and one blistered hand from pitching shoofs (sheaves) in the herring's close season: so what better opportunity could I have had for learning the Suffolk language? Alas, (there we go again) at the tender age of twelve and a half, three times a year, and for a total of 43 weeks per a., I was dispatched to the very heart of the Great Yen to listen to readings from King James' Bible, and sing the services of Cranmer's BCP in return for a dud education from which I have never recovered: the cathedral delivered a disastrous bargain for two reasons. In the first place I was made to open my mouth, use my lips and articulate every syllable separately and distinctly: all very necessary for KJ's Bible and the BCP; but for the Suffolk dialect - disastrous! Then, after 14 weeks of this treatment, I was sent back home to spend most. of the brief holiday in verbal isolation with THEM unable to understand me, and I having forgotten how to understand them. Two weeks later I was back at school with the situation reversed. Poor little boy! No wonder I was most thankful to discover some long while later that schizophrenia was a well-recognised and treatable complaint: I had been familiar with the symptoms for years. If I had been at school today the situation would be worse; with even greater changes taking place between one holiday and the next. When Mother becomes Granma, and her Mawther a mother without proper notice and legal certification, what does one do? "Do yer do as ee Do: dont yer ont do atall". said the old tenant farmer of his model landlord at the annual rent dinner. Having sorted out this compacted gobbet of wisdom I still have to sort out what is to be my first language when, once again, I start learning. 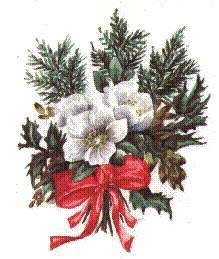 Anyhow, a very Happy Christmas to all readers: especially to those claiming to be Suffolk Born and Suffolk bred, and therefore, according to tradition, strong in the arm and thick in the head. Do not despair! For those in need we still have three alternatives for a second language to improve our learning abilities. Welsh, Gaelic or Erse will come in useful for holidays In GB, and anyone who can master any one of them obviously is in no need of improved learning skills. The House of Lords' judgement in the case of Shimizu (UK) Ltd v Westminster City Council affected the understood meaning of the term "listed building" in planning legislation and has serious implications for Civic and local amenity societies who monitor applications for changes to buildings especially within conservation areas. It used to be that "part of a listed building" was treated the same as a "listed building". Therefore works to demolish, or simply alter, a listed building needed listed building consent. Now, however, the Lords have decided that demolition refers to pulling down a building so that it is destroyed completely or at least to a very significant extent. Therefore a scheme of works which involves the demolition of part only of a listed building is deemed to be alteration and consequently will not now need special permission - "listed building consent". Whether works are for demolition or alteration is still a matter of fact and degree in each case. Many works will now only need consent if they affect the building's character as a building of special architectural or historic interest. The House of Lords also considered that works for the demolition of an unlisted building in a conservation area must also involve the total or substantial destruction of the building concerned. This means that many works that involve the destruction of part only of a building will not now require conservation area consent. Following the ruling the Government has made changes to Planning Policy Guidance Note 15 (September 1994): Planning and the Historic Environment. THE Civic Trust has opposed plans to allow 44-tonne lorries in Britain as fundamentally misconceived and has called for the development of a comprehensive strategy for freight to reduce the impact of heavy goods vehicles on local communities. Responding to the Department of Transport consultation paper on heavy lorries, Civic Trust director Mike Gwilliam said that giving 44-tonne lorries the freedom of the road network will undermine the stated aim of encouraging the transfer of freight from road to rail. Many firms might well use the extra capacity to reduce their number of depots and run the heavier lorries further. Heavier lorries are also likely to lead to demands for larger lorries. Historically, increases in lorry size have been followed by increases in weight and then by further increases in size. The Civic Trust believes that all heavy goods vehicles, including existing 38-tonne and soon-to-be-permitted 40-tonne lorries, should be restricted to a freight trunk network of motorways and near-motorway standard roads, with local deliveries being made by smaller lorries which meet stringent standards on weight, dimensions, fuel emissions and safety. I am sure members of the Hadleigh Society will be pleased to know that the new garden in the Guildhall has been much appreciated by visitors and the Cream Teas were very successful. I would like to thank the Society and individual members for their generous support of this project. As with all gardens the work will never be finished and we shall be replanting and improving the garden during the winter, ready for next summer's visitors. For 35p a day less than the cost of a pint of milk, every citizen has the reassurance of knowing that 125,000 professional police officers are on hand to help them. They are supported by 57,000 civilian staff, 19,000 special constables and all the equipment arid expertise necessary to cope with a wide range of situations - crime, drug misuse, violence, accidents, emergencies and traffic problems. Much of the work of the police is concerned with preventing those situations from arising in the first place. Policing is not a business. It is a service, but provided in a business-like way, and that means giving value for money. The police services of England arid Wales are doing exactly that; providing an ever improving service, meeting increasing and competing demands, with strictly limited resources. We cannot do it alone but we are very proud of the success achieved with our partners in the community. Though we note, sadly, a disturbing increase in some areas of criminality, our response is positive - we know we can drive crime down if we all work together and stop accepting that crime is inevitable. For the full Annual Report write to Suffolk Constabulary FHQ, Martlesham Heath, IP5 3QS. To an enthralled audience, many from Benton Street itself, Clive Paine delivered a dramatic account of a Hadleigh crime and its punishment. Presenting us with a wealth of detail drawn from original documents that are now in the Bury Record Office he brought the 200 year-old incident to life. Sarah Lloyd became an accessory to a crime of arson and burglary perpetrated against her employer, Mrs Syer, by her lover, Joseph Clark, it is said. Both were apprehended but the case against Clark was dropped whilst Sarah was sentenced to be hanged. Capel Loft, a radical Bury JP, was incensed by the severity and inconsistency of the judgement, and campaigned vigorously. He gained a stay of execution but so antagonised the Home Secretary that he was subsequently removed from the bench. His oration at the gallows and subsequently at the burial stirred unrest amongst some thousand people present. With American Independence and French Revolution only recent memories (with both of which he sympathised) the authorities were understandably concerned. 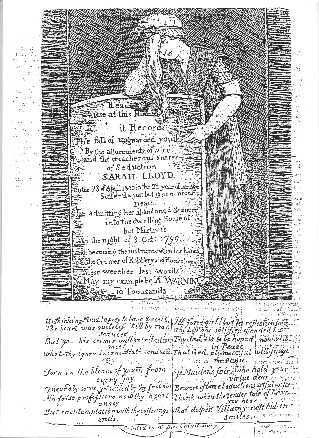 A memorial stone in Bury churchyard ensures that Sarah's name will not be forgotten. Capel Loft continued as a barrister, lived on until 1824 and left 25 volumes of poems. From his early years as a child prodigy through his acquaintance with many of the greatest literary figures of that time and his several quixotic legal adventures he was a fascinating character. Detailed as the records of the case were, we could not pinpoint the scene of the crime. If anyone in Benton Street finds signs of a fire, especially under the stairs they may be able to add one more detail to this tale. 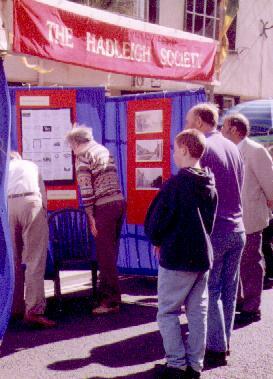 The Society's stand on 7th September. Nominations should include details of the improvement made or of work carried out and should be sent to reach the Hon. Secretary, The Hadleigh Society c/o 16 Highlands Road, Hadleigh, Suffolk by 1st March 1998. From the beginning of this year the Newsletter has been published on the Hadleigh Society Internet Site, with the advantage that many pictures show their original colour. You will find the address at the end of this Newsletter. We are delighted with the response to our first two informal get-togethers to discuss planning matters. Come along for serious discussions on major developments, or just for 2 minutes to put your point of view on a specific site. This is not a fixed 'group', nor is any regular commitment involved; we would like as many members as possible to 'drop in' and keep in touch with current planning issues, from Supermarkets and Industrial estates to box tombs and windows. We will continue to meet in the George every four weeks on the Wednesday before each Town Council meeting. Midday, but arrive earlier to line up a drink and chat. A meeting was held at 94 Benton Street on Thursday 2 October to discuss current planning issues and possible environmental activities. The only application needing discussion was for the development of Wilson's maltings. This proposes conversion of the maltings into residences, demolition of the timber-clad building on the site, conversion of the station into a dwelling and erection of several detached houses with separate garages. The following were agreed to be appropriate and useful environmental activities for the Society but no conclusions were drawn on their relative priority. It may be that there are members who would be interested in adopting one of these areas without becoming involved in all the meetings of the group. If so, please contact any member of the Executive Committee. Changes in the management of the Rowley's land adjoining Constitution Hill seems to be leading to closure of some paths that have been in common use, and possibly to closure of some that are legitimate rights of way. It may be that other organisations are monitoring our footpaths, but if not then the Society should do so. There may be a need to publish an up-to-date map of the local rights of way. An activity was started by the Executive Committee to compile a list of Listed Buildings in Hadleigh, but this has not been actively pursued recently. It would be a valuable resource since some details on the official list are known to be inaccurate and there is much scope for adding details, for instance relating to the rear of properties. An extension of this activity would be to identify new candidates which have emerged, being more recent properties, or as a result of further historical research. The Society has a collection of photographs taken by the Environment Group 10 years ago, covering Benton Street, High Street and George Street, together with a few other photos elsewhere. Individual members have also recorded properties likely to be modified. This sort of work needs to be maintained: several properties will have changed significantly since the last survey. The existing records need to be catalogued, with the results made available to the Hadleigh Archive. There is potential for linking this work with historical records of the properties as the basis of a presentation to the Society in the future. There will always be opportunities to improve the local environment. For instance, the state of the paving, or street hygiene. A sensitive issue, but one which sometimes needs attention. We sometimes hear of possible developments in advance of a formal application. More investigation and discussion at this stage would make the Society better prepared and more effective in tackling serious issues. There is also value in promoting positive planning ideas, especially where these would counter or avoid a threat elsewhere. The Group will meet again at 7:30pm on Wednesday 7th January at 94 Benton Street, Hadleigh - just come along. The Mayor of Hadleigh, Cllr. Robert Carr, in company with the Chairman of the former Trustees of the Hadleigh Market Charity, recognising the historical imnortance of the hand-over of responsibility for the management of the Guildhall Complex from the Charity to the Town, organised a gathering in the District Council Offices to formallv record the event. It was also felt appropriate to celebrate the 550th anniversary of the establishment of the Charity in 1438. The Chairman reports a good response to his ballot of members concerning their preference of Civic Area title, given present circumstances. No less than three to one members came down in favour of retaining the Babergh name, with quite a few agreeing to the continued use of the South Suffolk designation under the title, as appropriate. It is understood that the FIENDS OF THE GUILDHALL may hold another PORK SUPPER in the new year and could invite a certain Newsletter Editor as Ghost of Humour (but not this one.. Ed.). It is reported that some Society members received their last newsletter somewhat belatedly. This was due to a change of distribution arrangements (for which we apologise most sincerely - Ed. ).